An exhibition celebrating one of the founding fathers of British car making is aiming to offer a fresh insight into a modest man who donated the modern day equivalent of £1 billion to good causes. Morris the Man at the Heritage Motor Centre in Gaydon marks the centenary of the founding of William Morris’ car making empire. Although more often associated with his native Oxford, Mr Morris was born in Worcester and had many other Midland connections – buying the Birmingham car maker Wolseley Motors and establishing Morris Commercial, the commercial vehicle making arm of Morris Motors, in the city. He also had an engine company in Coventry. The exhibition, which runs from March 23 until September 1 and includes a recreation of Morris’ office at Cowley as well as material from the Heritage Motor Centre’s archives, looks at his early life, his move into car making and his role as one of Britain’s great philanthropists. Morris began building bicycles in his mother’s kitchen before he saw a market for his own design of car. His first car – the Morris Oxford – rolled off the Cowley production line in March 1913. By the mid-1920s Morris Motors had become Britain’s largest car manufacturer and one of the biggest in the world. Though he became a very wealthy man, Morris had no family of his own and gave a large proportion of his fortune to good causes in medicine, social welfare and education. Over four decades these donations totalled £30 million, which it is estimated would equate to £1 billion in today’s money. He became Lord Nuffield and his name adorns many well-known institutions, including Nuffield College at Oxford University, the Nuffield hospitals and the Nuffield Foundation. Stephen Laing, curator for the Heritage Motor Centre, said one of the defining characteristics of Morris was his desire to help people help themselves. “He liked the awards and attention but having no family he invested money into things that interested him,” he said. “He gave a lot to institutions, hospitals, universities and organisations to help people better themselves. They were not handouts but things which would give them a leg-up. “He had made his own way and the idea that people could just get a handout without working hard for him was anathema but if they were in hardship and he could help them he liked to. Morris had many strengths, according to Mr Laing but one was his foresight in adopting a new approach to the process of car making by sourcing components from different places, paving the way for how most cars are made today. “Rather than make everything yourself he believed if you could source the best components to make cars you would have quality and affordability. “At that time a lot of the big companies tended to make everything themselves. It was said Longbridge was a place where raw steel went in one end and a car came out the other. “The Morris philosophy was if you could buy or source things from other companies and put it together efficiently you would get a good product and it would be cheaper. Much is made of the famous Austin-Morris rivalry, Birmingham-based Austin and Morris were the car-making powerhouses of early 20th century Britain and in Herbert Austin and William Morris they had two visionary founders. 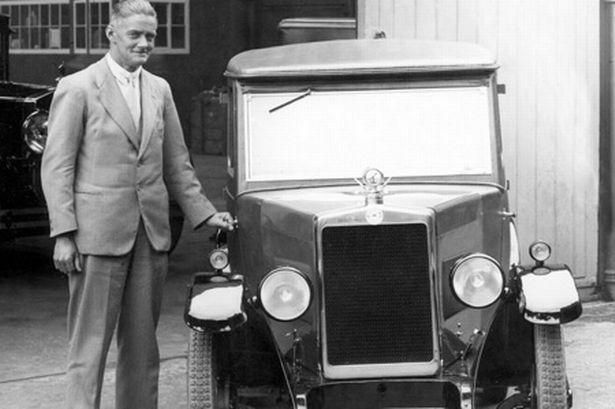 Despite competing for decades the two firms did eventually join forces under the BMC umbrella – later to become British Leyland – after the death of Herbert Austin. “There was definitely a lot of rivalry, as they were competing in the same market,” said Mr Laing. Mr Laing added that such a tie-up was typical of the “post war progression of the motor industry” and in line with the way Morris liked to operate. “Morris himself had already started it,” he said. “Originally he had a small company and he bought others over the years, including ailing companies like Wolseley. He realised the positives of having companies of large scale. Morris’ modesty can perhaps be evidenced by the fact he always preferred the more ordinary cars he made, according to Mr Laing. “His favourite cars were never the big cars in the range but the smaller ones like the Morris Bullnose and the first Morris Minor and the Morris 8,” he said. “Those were the cars I think he was most proud of because they allowed the general public to buy a motor car. It wasn’t just Herbert Austin’s Austin 7 that put Britain on the road. Morris was making a car that was available to more people right from 1913. “He reputedly called the later Morris Minor a poached egg because he didn’t like the shape of it. Though he was derisory of the style I’d say he was quite proud of it because it was so successful, so he was probably more accepting of it than people think. The show is as much about showing Morris’ human side as his manufacturing successes. Mr Laing added: “One of the things we were really interested in doing was to have a look at Morris himself. A lot of people know the Morris Minor or Morris 8 but not a lot of people know what he was like as a person and I don’t think many people know just how generous he was. “If he could have done anything differently I imagine he would probably have wanted children and to have invested some time in a family. But in the end he invested it in all these other good causes. “I think he certainly produced an affordable motor car of good quality and his techniques in production were always at the forefront.